Some people think that they can just do what they want, even if we don’t want them to do that. After all the Gianas-Return Team holds the copyright for Gianas Return and we can decide where the game is going to be published or not. The affected people will know who they are… We hope you have reached your goal by not accepting our wishes. Ich hab Deine eMail bekommen und sitz grad an ner Antwort. verstehe den eintrag nicht. soll das heißen das euer neuer giana teil nicht mehr für das dreamcast kommen wird? Giana is just a bad made clone of super mario, if it’s not going to be released this will be a great benefit for all peoples. Wee don’t need rubbish like that!!!!!!! Of course it’s a bad clone, in fact if not the worst. Thanks for your worthy opinion! At least it won’t be the first platform version – this is 100% sure for now. Dependings on how the situation clears up, we might change our mind. Well, this is definitely bad news! I can’t really understand how some people such as Mr. “Friday” above can drop stupid messages such as this one when it comes to an ambitious project like Giana’s Return which absolutely receives full support of the gaming-community. These guys spend a lot of time and invest shitloads of effort and work on what I believe is going to be an awesome game (at least the first released DC-version which had only minor flaws and the new screenshot hint at it…). If these haters (who only have injustified negative critics instead of constructive suggestions to make) think they know all better why don’t they bless the world with their own splendid remake of a timeless videogame-classic? I guess those people are fakers cause when the game is released they are going to be the first ones spending hours and hours playing the game, ha! I have to point out that some peoples’ attitude is just shocking so I can sadly understand the authors decision to freeze, delay or (hopefully not) cancel development of the DC-version. But that’s life: there will always be some who can’t do better but to complain in order to let them seem important. Especially over the internet. I’ll include the DC-version of GR into my prayers and I hope the developer-team won’t get too pissed off or demotivated by a bunch of silly #*$%. Just think of those who appreciate the work you do. 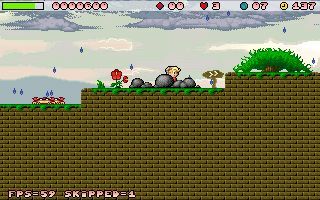 I’ve been waiting for almost 15 years for decent follow-up or remake of “The Great Giana Sister” and seeing the conversion to my now almost-favourite platform endagered keeps me more than worried! However, I thank the team involved with this project for their efforts (has anyone done this recently???) no matter whether they decide to release the DC-version or not. Hmm. More than dissapointing, a crushing blow. I have been reading this website for literally years now waiting on this game to be done, so that finally there can be a new breath of life in my favorite 2D genre. I have supported you guys, and in fact even paypaled you money when you had the option up. I am just letting you know I am never coming back to this site. I have given up. It is not fair that the majority is punished for the misdeeds of the few. I never liked it when they did that crap in school and I dont like it now. I am sorry someone ripped you off. I am sorry it hurt your feelings and made it feel like your work was frivilous or not as important but that simply does not make up for you hurting the dreamcast community that has been your biggest supporter. Look at Senil Team and beats of rage or feet of fury or any of the other home brews. Some of them have been copied modded cropped chopped and hacked but they have all been loved and adored by the masses, and the true authors got the credit for it. I wish you guys luck in the future. But if I come across a copy of your game, finished or not, I will not play it out of principal. This is the last straw. Ive put up with coders quitting artists quitting website changes website outages, long lost periods of no updates, but I refuse to be punished for something I did not do. Good luck! Stalled does not mean cancelled – there is a very big difference. If you have donated you did that because you enjoyed the v0.9 Beta and no one forced you to do so. Complaining about that now is quite ridicolous. Please understand that good things need time and the whole team is doing that stuff in their free time. Some of us are working 40-60 hours per week and have something called real life too. With the vacation of the coder and now the project organizer the project would be automaticly stuck for one month by default. The DC version is stalled?